I changed the oil on the V1 today, and put her to bed for the winter. While I was adding oil, I watched the level go up and down in the sight glass. I ended up putting in 1 gallon (US), rather than the 4.0 quarts the manual calls for. However, I don't see any oil line across the sight glass. Meaning, I guess, the oil level is above the upper line. Is this normal? While running the bike all year, I would always see the oil line across the centre of the sight glass. Last edited by CuddyBuddy; 11-19-2018 at 08:12 AM. Did you start the bike and let it idle till the oil light goes out and shut it down before checking? Is there a color difference in the sight glass between side and center stands? Kyle E and CuddyBuddy like this. Yes, changed the oil filter. And added a few ounces to the new filter before installing it. Yes, let the bike idle till the oil light went out. However, your post got me to thinking. I did not allow enough time for the oil to settle down after the bike was idling before checking the level. Just went to the garage now, and all is good. Oil level is right in the centre of the glass. Last edited by CuddyBuddy; 11-15-2018 at 09:10 PM. Just one more check. Was your bike on center stand or side stand during oil fill and level checking. CuddyBuddy and 52Degrees like this. Centre Stand. Just an amateurish mistake, forgetting to let the oil settle before checking the level. Been changing MC oil for 15 years now, first time I've done that. I'll blame either old age, or the fact that it was pretty chilly in the garage when I was changing the oil. No worries...at some point of time we all pass that stage, glad to know all is well. Reading this post makes me wondering: A V1000 need to be on the sidestand to read oil level??? Not on the centerstand? I lived in Brighton from about '71 to '74 - yup - it can get 'chilly' this time of year. red liner and CuddyBuddy like this. Page 120 of my manual says "With the motorcycle held level, the oil level should come up between the upper and lower level lines next to the inspection window." And page 121 talks about changing the oil, and says "Let the oil completely drain with the motorcycle perpendicular to the ground." For those of us without riding partners, the center stand works well enough. I changed the oil on the V1 today, and put her to bed for the winter. While I was adding oil, I watched the level go up and down in the sight glass. I ended up putting in 1 gallon (US), rather than the 4.2 quarts the manual calls for. However, I don't see any oil line across the sight glass. Meaning, I guess, the oil level is above the upper line. An American gallon = 4 US quarts. Engine oil capacity is actually 4.0 US quarts when replacing filter. It should always be held up balanced vertically for a precise and reliable oil level reading. ○Situate the motorcycle so that it is perpendicular to the ground. ○If the motorcycle has just been used, wait several minutes for all the oil to drain down. ○If the oil has just been changed, start the engine and run it for several minutes at idle speed. This fills the oil filter with oil. Stop the engine, then wait several minutes until the oil settles. Racing the engine before the oil reaches every part can cause engine seizure. If the engine oil gets extremely low or if the oil pump or oil passages clog up or otherwise do not function properly, the warning indicator light (LED) and oil pressure warning symbol will blink. If this blink stays on when the engine is running above idle speed, stop the engine immediately and find the cause. -If the oil level is too high, remove the excess oil, using a syringe or some other suitable device. Engine oil capacity is actually 4.0 US quarts when replacing filter. Last edited by CuddyBuddy; 11-19-2018 at 08:13 AM. I bought this flexible mirror from Harbor Freight so that I can sit on the bike, to hold it upright, and veiw the oil level through the window. Last edited by kawimassgirl; 02-24-2019 at 08:07 AM. Shouldn't that be a selfie stick in this modern era? 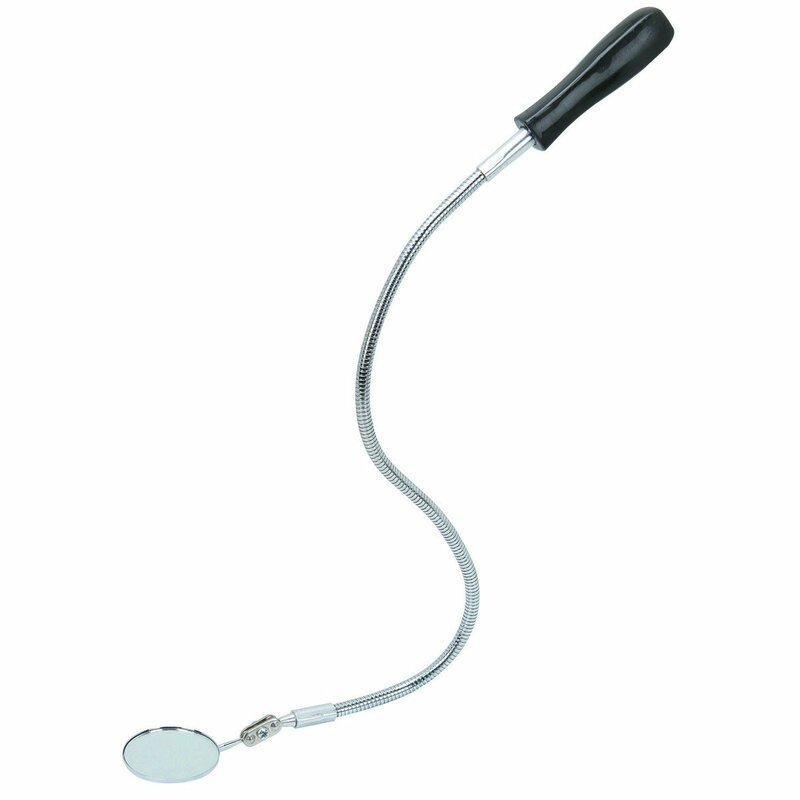 [QUOTE=kawimassgirl;1607711]I bought this flexible mirror from Harbor Freight so that I can sit on the bike, to hold it upright, and veiw the oil level through the window. Wow, way cool and an answer to my prayers. I always seem to have to reexplain the hash marks to my wife. So now I usually grab the neighbor kid or if one of my friends is stopping by I grab them to look in the sight glass. Had been thinking about mounting a mirror to the end of a broom handle. Since I live within walking distance of a Harbor Freight I will get one of these. Than I can also stock up on cheap vinyl gloves for the next oil change. THANK YOU! MY experience has been that IF you check the oil right after riding (get off, V on sidestand, and held vertical) - you can see a line of small bubbles at the oil's level on the sight-glass. jschmitt0715 and Nivek like this.